In 2011, Chicago’s Goose Island Brewing Company shocked the rest of the beer industry when it sold to AB-InBev – the largest brewing company in the world – for a reported $39 million. There had been many brewery buyouts before this one of course, but none that had reverberated with as much force as this did. Goose Island was and still is a staple of the Chicago craft beer scene and had been since its establishment in 1988. However, no one quite expected the story of this much-loved brewery to veer in this direction and the shock of its sale can still be felt to this day. Perhaps the major difference between the sale of Goose Island and those that came before was social media. The unified voices of Facebook and Twitter, along with the likes of Reddit and Instagram, gave everyone with an opinion on the sale a platform. This in turn allowed any negative feelings about the sale to swell like a tsunami, ready to come crashing down on the brewery’s reputation. It survived, of course, and with AB-InBev’s investment Goose is rapidly becoming one of the most recognisable brands in the world. The familiar goose head tap handles are becoming a common sight in pubs and bars across the UK; the brewery now even has its own bar and restaurant, The Vintage Ale House, in Balham, South London. The sale of Goose Island was the start of a string of well-loved craft breweries across the world being picked up by international megabreweries. AB-InBev went on to snag Seattle’s Elysian Brewing, Oregon’s 10 Barrel, Italy’s Birra Del Borgo and the UK’s Camden Town Brewery among others. The latter sold for a reported £85 million in 2015, more than twice the valuation of Goose Island just a few years previously. MillerCoors got in the act when they picked up a trio of breweries including Athens, Georgia’s popular Terrapin Brewing Compay. These sales pale in comparison, however, to California’s Ballast Point, which went to high-end wine and Mexican lager merchant Constellation Brands for (holds pinkie finger to bottom lip) one billion dollars. Heineken too got in on the action, picking up a 50% share of Lagunitas brewing for $500 million, giving them roughly the same valuation as fellow Californian’s Ballast Point. In fact, at the time of writing this, Heineken completed the sale which began in 2015, finally acquiring the remaining 50% of the company for an undisclosed sum. The latest billion-dollar craft brewery? Brewdog; the brewery that swore it would never sell out (a pledge it continues to stand by, despite having done so) which recently sold a 22% stake in the business for £100 million to a San Francisco based private equity firm. It’s not just the really, really big guys that are investing though. With the capital of private equity firm Fireman Capital behind them, Colorado’s Oskar Blues has picked up two breweries: Michigan’s Perrin and Florida’s Cigar City. The big question is what would lead a self-styled ‘craft’ brewery to choose partial or complete sale as the best route to growth. David Walker is the co-owner of the respected California brewery Firestone Walker. He founded the brewery with his business partner and brother-in-law Adam Firestone in 1996. They had plenty of investment from the Firestone eponymous (and extremely successful) winery business, but in 2015 Firestone Walker sold an undisclosed percentage of the brewery for an undisclosed sum to Belgium’s Duvel-Moortgat. Walker was refreshingly frank when I quizzed him about the reason for this in an interview for Good Beer Hunting last year. Walker’s final point is a pertinent one. Beer lovers often rail against the purchase of small craft brewers by ones they perceive as megabreweries, far more interested in profit than the actual beers they produce. In the case of AB-InBev they may well be right, but it is still entirely possible that a relatively smaller brewer like Duvel Moortgat might be similarly motivated by profit in an investment like this. Perception counts for a great deal in these situations and Firestone Walker’s decision to partner with Duvel Moortgat seems to have been its saving grace. Around four years ago, the Camden Town Brewery was a regular hangout of mine. I’d spend most of the days leading up to Friday evening thinking about cool, crisp and powerfully hopped pints of its India Hells Lager before guzzling down as many as I could when I finally made it to the bar. Naturally when Camden Town made its choice to partner with InBev, I was awash with emotions and, in the early days, the biggest of these was disappointment. Disappointment that something I cherished as ‘local’ no longer felt so. Time is a great healer though, and I’ve long since learned to accept Camden Town’s fate; in fact I’ve made several efforts to understand and interpret it, which culminated in me sitting down for a face-to-face chat with the brewery’s founder, Jasper Cuppaidge in Spring 2016. As with Goose Island, Cuppaidge and his brewery copped a lot of flak from fans after its acquisition by AB- InBev. However you feel about the situation though, there’s no denying that Camden Town has become one of the most visible beer brands in the United Kingdom, and the start of brewing at its new £30 million facility with only accelerate this progress. For those that live outside of the craft beer bubble this is a great thing. 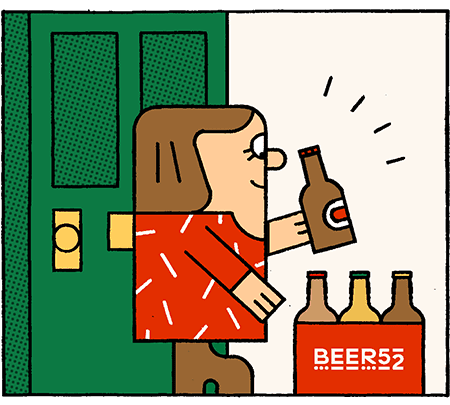 While ardent beer fans may stoically choose only to drink beer from independent brands, there are many others that might simply be thankful for a little more choice in the supermarket. Hell, they might even be inspired to explore our little beer world even deeper if we’re lucky. Sofia De Crescentiis formerly worked as a sales representative for Camden Town Brewery. She also was one of the breweries “Hellsraisers” – the name the brewery bestowed on those that invested a combined £2.75 million when it sold equity during a round of crowdfuning before its eventual sale in 2015. She has since moved on and works as sales manager for fellow London brewery Redchurch. However, the reality didn’t quite live up to her expectations and with budgets allocated elsewhere – mostly towards the construction of a new £30 million brewery – De Crecentiis eventually made the decision to move on. However it wasn’t out of a desire to work for an independent company specifically, despite there being a sense that she preferred to work for a smaller, more closely knit team. I also spoke to Pete Brown, a fellow ex-Camden employee who recently went on to establish his own brewery, Forest Road. Brown’s sentiments towards big brewery buyouts are not quite as sympathetic as those of his former colleague. He cites Goose Island as a prime example of this, but feels no ill will towards his former employers at Camden Town. What’s interesting to me is the different perspective with which he views the Firestone Walker partnership with Duvel Moortgat. There’s definitely a sense within the industry that Duvel are just as focused on quality and innovation as they are on profit. That same association isn’t usually held of AB InBev, whether this is fair or not. “There’s one thing in common with the breweries that Duvel has invested in and it’s that they make incredible beer. Adam Firestone and David Walker have been brewing for like 20 years and make some of the best beers in the world hands down,” Brown says. Instead of opting for investment from a larger brewery, Scotland’s BrewDog chose the path of private equity when it sold 22% of its business for a reported £100 million last month. Essentially this means the brewery has received capital from a private firm that will, in turn, expect to see a large return in its investment within a short period of time – typically five to seven years. The challenge here is that BrewDog’s “never say die, never surrender” rhetoric, which it has been pushing for the entirety of its 10-year existence, is now working against it. “I have no feelings besides curiosity as to what made businesses like Laguintas and Firestone Walker make their respective deals, but BrewDog’s sellout is an exception to my lack of sentiment,” De Crescentiis says. “They have not only de-listed, but publicly put down several other breweries for selling out, and have even gotten some PR off the back of their nay-saying. For Brown, the concern is more that with big craft breweries receiving investment or being acquired by even bigger breweries, it will become incrementally more difficult for breweries such as his own to compete. Lagunitas is everywhere on draft in London now where Heineken usually was. Good news for the drinker, but bad news that London breweries like us that can’t really compete on the same terms,” he says. At the time of writing this article, AB-InBev had just acquired its tenth craft brewery; North Carolina’s Wicked Weed. The backlash towards the Asheville based brewery, which is famed for its range of highly- rated sour beer, was quick and unrelenting. Interestingly, much of this scorn came from the industry itself. Perhaps this is a sign of widening concern that small craft breweries are finding it increasingly difficult to compete against the megabreweries on a level playing field. Breweries are going to continue to sell out, and it would be naïve of us to think otherwise. However, instead of being angry or disappointed, we could do well to act a little more like the breweries we love by innovating and being mindful about where we spend our money. There are around 20000 breweries in the world, the vast majority of them independent, so we can spend our money wherever we like. Just remember to enjoy the beer that’s in the glass in front of you when you do.